Camping Le Bosquet är en camping i Canet-Plage, Pyrénées-Orientales, belägen vid havet och vid en flod/ en bäck. Campingen har platser med stängsel, med skugga, utan skugga och platser med lite skugga. Det finns möjlighet att hyra husbilar. På campingen finns en lekplats och ett sportområde. Vem vill inte efter en hård dag slappna av i en jacuzzi och ett beautycenter. Campingen förfogar över en utomhusbassäng och ett knattebad. I den närliggande omgivningen kan du också simma i havet. Denna inspektör gör varje år ett besök på Camping Le Bosquet och inspekterar campingen för ca 200 faciliteter och för andra förekommande punkter. Inspektören är en medarbetare från ACSI och arbetar inte för campingen. What a cracking campsite. The pitches are various sizes and shapes so there’s a pitch to suit everyone. We were told to just pick one as it is early in the season. The camp site is really informal and friendly. The staff are brill, always a ‘bonjour’ and a smile as we tried to converse with them in our pidegon French. The beach is a 500m walk away down a path at the side of the camp, and if the dog goes in for a swim, there is a doggie shower to rinse off your furry friends before returning to your motorhome. A supermarket about a 5 minute drive away, although you can get fresh bread at the onsite shop by ordering it the day before. The snack bar does good food, burgers, fries, pizzas. As it was early in the season there was no entertainment, and that really wasn’t a problem for us, armed with iPads and Sky Go. There are playgrounds for the children and the pool area is certainly geared towards them. I braved the pool just once, on a hot day. It was bracing to say the least, and could do with it being a slightly higher temperature assuming its climate controlled. And there seemed to be loads of ants everywhere on the swimming terrace, so much so that I did not pullout one of the sun lounges for a read. Again, maybe too early in the season for action. In the main it’s a quiet site at night and most of the day, although there is occasional noise breaking through from the much larger surrounding campsites. And it’s really dog friendly, so expect some barking during the day. After all, that’s how dogs communicate. But in the main you can read your book to the sound of the wind rustling in the trees, and the birds chattering. It’s the kind of place you could spend a few weeks at, just relaxing, and we did. Three weeks in all, and will definitely be returning if they will have us. We visited this site in April this year where my husband took very ill. Jonathan Laude the director and his staff could not have been more helpful and kind. This is a truly amazing site run by lovely people. I stayed on the site and travelled back and forward to the hospital feeling safe and secure surrounded by lovely people, true good Samaritans. Vill du boka campingen Camping Le Bosquet eller få mera information? Det går bra med nedanstående uppgifter eller via campingens webbsida. 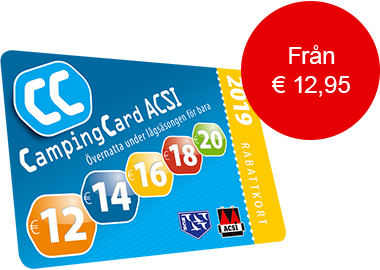 ACSI Eurocampings skickar din informationsförfrågan till "Camping Le Bosquet".